In this episode, we’re talking about how to bulletproof your online store from data disasters and security issues that are more common than you think. Mike Potter joins us to discuss. He’s the co-founder and CEO of Rewind.io, an online backup service for SaaS apps. His company is trusted by thousands of ecommerce merchants to backup their Shopify and BigCommerce stores. There’s a saying that entrepreneurs like to move fast and break things. 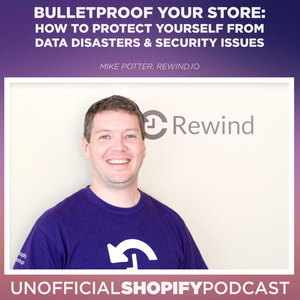 To that, Mike Potter would say: “go ahead and break things - just make sure you have a backup.” Since launching Rewind in 2015, he’s talked with hundreds of merchants who really did break their store - whether it was their fault or not - and helped them get their site back to normal. Having experienced data loss himself, Mike is passionate about helping small businesses to better protect their data and digital assets.